I finally got around to adding the Board Room Ribbon to my Origins Preregistration so I’m completely ready to go now. I live in Columbus so attending the con is extremely convenient. Last year was my first year and I enjoyed it but my back was really hurting and I couldn’t spend a lot of time on my feet or in a chair. I only made it through the exhibit hall one day and didn’t get in any gaming in the board room. This year however I’m hoping it will be different. I have a two day pass for Friday and Saturday and I purchased the add-on Board Room Ribbon. My back is healthy (knock on wood) and I’m eager to try out some of the new games. If anyone that reads this blog is attending I’d enjoy meeting you and having a go at a new (or old) game or two. After a morning of rainy baseball and softball games, Sophie and I sat down for two back to back games of Samurai. We really like the game and she’s beginning to become a worthy opponent. Samurai, designed by Renier Knizia, has a 4 piece board depicting the islands of Japan, three token types (high hats, Buddhas, and rice paddies), a player screen, and a set of tiles for each player. Players begin the game by placing all of the tokens out onto the connected boards (their counts are adjusted by the number of players) one piece at a time. 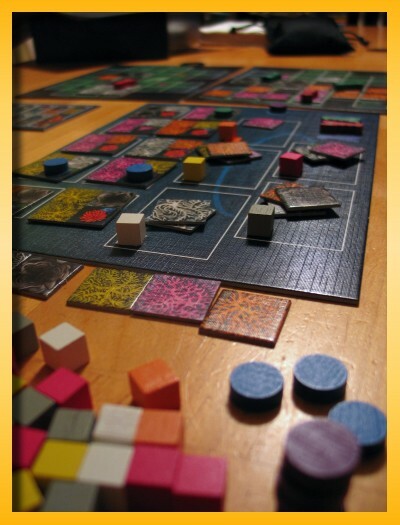 Each player then selects 5 tiles from their private supply to place behind their screen. All unselected tiles are turned face down and shuffled representing a random draw pile to restock tiles after each play. When Sophie and I play we usually start the game with 5 randomly drawn tiles to remove any sort of advantage I might have at recognizing board layout. Another variant would be to allow a weaker player to hand select their tiles while the stronger player would draw theirs at random. Play alternates with each player placing one or more tiles from behind their screen onto the board. Once placed the tiles never move (see special tile below). The goal is to cause the tokens to become surrounded on all sides by placed tiles. Once surrounded, the player with the most influence captures the pieces and places them behind their screen for end game scoring. A zero-valued tile that can be substituted for an already placed tile allowing the player to reuse/move a tile on the board. Some of the tiles have a special Japanese character on them allowing the player to play multiple tiles in the same turn. In general on your turn you can play as many of the specially marked tiles you desire along with an optional single tile without the special mark. After you’ve played all of the tiles you desire, you restock your tiles from your supply until you again have 5 behind your screen. The game ends immediately when one type of token has been completely removed from the game. Players reveal their captured tokens and the winner is the player that captures the majority of two token types. If no player has the majority of two token types, the rules breakdown the tie breaking scenarios by eliminating players who have no majority. The remaining players set aside their token representing their majority and the winner is the player who has captured the most token not in the majority. If there is still a tie, the winner is the player who captured the most tokens. Samurai is possibly my most favored game in my collection. When I found my copy, the game was out of print but I managed to find a dusty copy on a shelf here in Columbus. I found it when I was just getting started in Eurogaming and it still holds the extra special soft spot for me. I like the tense play with the entire range of players (2-4). It plays quickly. It is fast to set up and tear down. My available gaming time has shrunk over the last few weeks and I don’t see that changing any time soon. Work commitments, adjustments to the new summer schedule, out of town weddings to attend, etc. are really taking a bite out of my free time. I’ll be missing the next CABS meeting since I’ll be in Oklahoma making it my third miss in a row. Bleh! We had a a small group for the June installment of Analog Game Night. Mat had a last minute commitment at work, Paul had to attend his daughter’s 8th grade graduation, and Tim had to stay home with the kids since his wife is out hiking some of the Appalachian Trail. That left Keith, Ken, Rich, and myself. I cracked open Lexio while waiting for Rich to follow the boop boops of his GPS to Keith’s house. Lexio tiles are exceedingly cool but the ridiculously flimsy plastic chips used to keep score during the game are another matter. I’m committed to buying clay poker chips to replace them. I think Keith enjoyed the game more than the image shows but I could be mistaken. Lexio consists of a set of bakelite tiles, in 4 ranked suits (red > moon > star > cloud), numbered 1 to 15. It’s normally played over 5 rounds or until someone loses all of their chips but I suspect that that is an unlikely situation. The numbered tiles are also ranked in the following order 2 > 1 > 15 > 14 > … > 3. The following player must lay the same number of tiles and their play must beat the last play of tiles. If the player cannot play he must pass. Play continues as many times around the table until nobody can beat the last meld. The tiles are then pushed to the side of the table and the player who ‘won’ the hand begins the next hand in an attempt to get rid of all of their tiles. 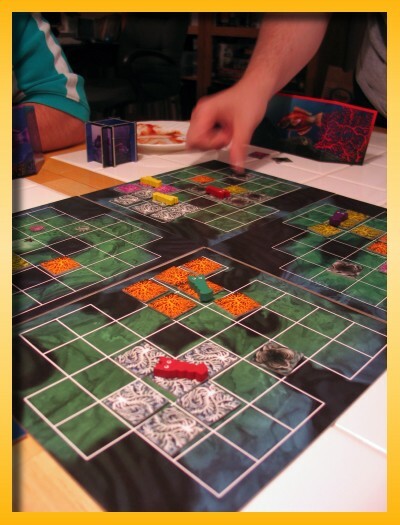 The round ends immediately when a player plays the last tile in his hand. At this point all players pay all other players a number of chips equal to the delta of the number of tiles left in their hand and the number of tiles in the other player’s hand. I like the game on several levels and my only real complaint, besides the quality of the chips supplied with the game, is that I felt like I spent a lot of time flipping tiles over, shuffling, and dealing them out rather than playing. The hands move so quickly that it seems like before you know it, you’re back to shuffling and dealing again. The use of tiles, although a nice adaptation, does make the flow of the game clunkier than the card based form upon which it’s based. Next up was Reef Encounter. Richard Breese, the designer of the game has said that he feels badly for the person who must learn the game by reading the rules rather than being taught. After spending close to 4 hours reading the rules, and reading up on the game’s forum postings on BGG I understand what he’s talking about. The game is rather complex to describe due to the interrelationships between all of the actions one can take. Writing about any one aspect requires you to describe other aspects of the game that you haven’t gotten to yet. However, if you put a little thought into how to teach the game, it’s not really that complex to understand. That said though, the game is difficult to grok. I’ll resist describing the game in any semblance of depth since I’m painfully aware of the limits of my abilities as a writer but I will attempt to describe it at a high level to give readers a flavor of how the game works. I recommend the following Reef Encounter Beginner’s Guide if you would like to read a more detailed explanation of the game. Coral strength tiles depicting the relative strength of corals. When corals invade the space of other corals, the Coral strength tiles are consulted to determine which coral is stronger. Alga disks used to adjust the relative strength of corals depicted on the ‘open sea’ board. Alga disks flip Coral Strength tiles reversing the strength of one type of coral over another. Shrimp – Each player has four shrimp they use to protect corals from invasion but the shrimp are small and can only protect small areas of coral. 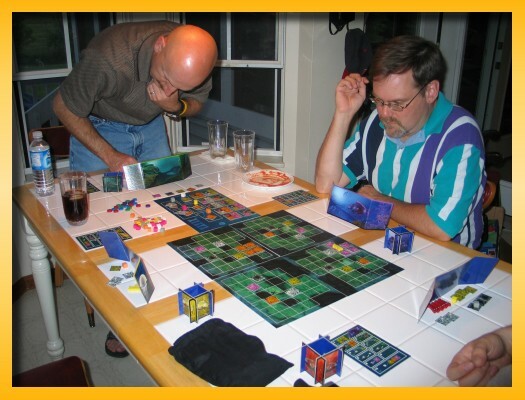 Each player has an open cube representing their parrotfish. Once the parrotfish has eaten corals and the player’s four shrimp, the game is over. On each turn, a player chooses numerous actions to perform. The bulk of your actions have no required order but if you choose to feed your parrotfish, then that must be chosen as your first action. After performing as many actions as you can afford and desire, your final action action allows you to grab a larval cube and some polyp tiles assigned to it from the open sea board. Some actions can only be performed once and others can be repeated as many times as you like. Luckily the handy reference card does a good job of summarizing your options. 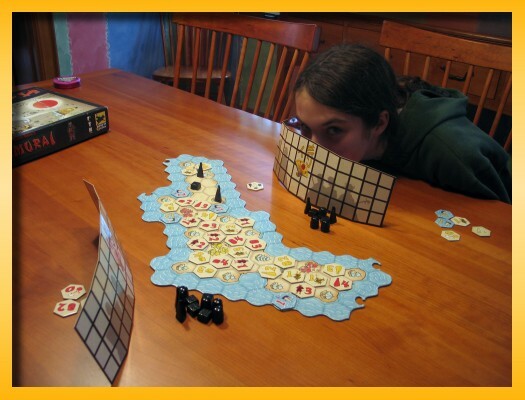 In general, the game is a complex dance of grabbing the larval cubes and polyp tiles you will need for subsequent turns so that when your turn arrives you can use them to expand your coral presence, invade other corals of lesser strength giving you additional polyp tiles to lay, and to lock in coral strength tiles with alga discs for the end game scoring. The game frustrates me on several levels. However, it’s premature for me to make any sort of overarching judgements. While playing, I’ve felt that maybe my brain just isn’t up to the task of juggling all of the moving parts to see a good move given the resources I have. I never seemed to have the polyp tiles I needed to do anything exceptional. I was always missing the larval cube I needed to pull off a sneaky move. I always seemed to be out of consumed polyp tiles hamstringing me from buying an alga disk to lock in coral strength. The draw bag was always a harsh mistress to the open sea board by marrying useless tiles with a much needed larval cube. Of course, maybe it’s just because I haven’t experienced the game epiphany yet, or I’m just bad at this game, or maybe I’m just not smart enough. The game felt overly long with four opponents but I suspect it’s because nobody has experienced the epiphany. Every play was torturous. I’m also not fond of games with very much downtime between turns if that downtime cannot be put to good use. With four opponents, it’s difficult to plan very far ahead if you’re hoping for some luck on the open sea board. By the time your turn arrives, your options may be totally different. Is that because the game is mostly tactical, in which case I don’t like the downtime? Or is it because we’re naive and we aren’t seeing the logical strategic plays staring us in the face? Like most things, the truth is probably somewhere in the middle and because of that, I’ll be trying to get Reef Encounter back to the table. However, that might be tough in my group since I think two out of the four of us would pass on future plays if given the option. Okay…I admit it. My normally repressed obsessive compulsive tendencies are periodically but profoundly plucked from their comfy spot and thrust into the full sunlight by my gaming hobby. However, my raw exposed OCD is hardly a rarity in the fringe-dwelling, eccentric, Eurogamer demographic. Yesterday I received my new copy of Lexio and I had the tiles spread out on my dining room table in all their glory and when I went to put them back in the extremely well designed box insert (a rarity mind you), I felt compelled to sort the tiles by suits (sun, moon, star, cloud). To take it a step further I simply had to arrange them in numeric order so that the smaller numbered tiles were on the bottom running left to right (1,3,4,5,6,7,8) followed by a second layer of tiles (9,10,11,12,13,14,15). The ‘2’ tile is placed separatedly in its own slot where the special artwork can be displayed next to its companion ‘2’ tiles in the other suits. If that wasn’t enough I had placed the lower numbered tiles on the bottom to hide the fact that the ‘2’ was missing from the order.The pièce de résistance came when I made sure that the ‘2’ tiles and the field tiles were arranged within the insert in suit order as well: sun > moon > star > cloud. Himalaya – At game end, everyone must place their yak, stupas, delegates, and programming disks in a separate baggie. Reef Encounter – I just got this game and the packing bugs me. I have to dismantle the parrotfish each time and the game came with several baggies but I don’t know quite how they expect me to use them. I feel like I’m being inefficient because I don’t think I need all of them. Did they figure out a really cool but obtuse way to pack the game that I’m just not seeing? Memoir ’44 – The opposing forces cannot mingle in the box because they’ll fight when I’m not looking! Duh! Do you have any games that feature aspects of packaging or gameplay that cause an itch on your psyche? I brought my copy of Lexio into work today and I’ve had many “Ooooh what’s that? !” kinda comments. I hopped out to Boards and Bits to give people a chance at picking up a copy and they don’t have any in stock…and neither does Fun Again. You get lucky sometimes I guess. I just hope that my luck isn’t all gone now, because I am so counting on winning the lottery to feed me later in life. Last night I conned Lisa into trying out a few rounds of 2-player Reef Encounter with me to finish off our 20th Wedding Anniversary. I fully expected to only play a few rounds but wouldn’t you know it but she got involved and didn’t want to stop! She ended up beating me by 6 points (42 to 36)…darned white polyps! I need a few more plays with different numbers of opponents before I can really say much about the game but I did really enjoy what I’ve experienced so far. The 12 pages of rules from the Z-Man reprint are horrid. I think the game is easier to teach than it is to describe in text. Many of the features of the game are circular in nature and it’s difficult to discuss any one aspect of the game without mentioning others that you must wait until later in the rules to describe. But, I’m getting ahead of myself and I’ll write more about that at a later time. Suffice it to say that Lisa and I talked a lot about the game afterwards and she even mentioned that we should play again soon so that she can play faster. I should clarify that, for her, if she doesn’t play several games quickly back to back, she’ll forget it all and she’ll have to ask a thousand questions again slowing down the game. A new game arrived today. 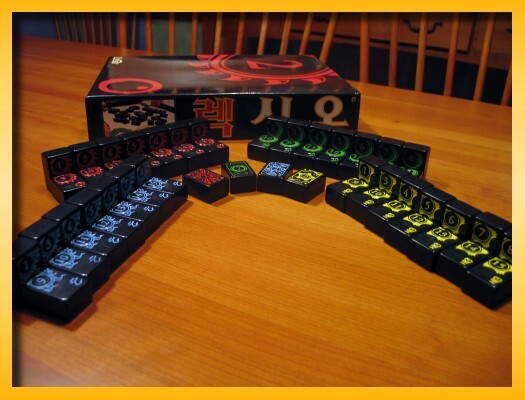 Lexio is a 3-5 player game published by the Korean game manufacturer Dagoy. To be honest, I bought the game because it’s simply gorgeous. The tiles are made of the same material as dominoes but very thick measuring 7/8″ wide x 1 1/4″ long x 5/8″ thick. The tiles come numbered 1 through 15 with the number 2 tile adorned with special artwork. The ‘suits’ of the tiles are sun (red), moon (green), star (yellow), and cloud (blue). The game also comes with a set of plastic chips that are used to keep score. The play in Lexio is very simple and reminiscent of a simplified form of Tichu. Unlike most ‘ladder games’ played with cards, Lexio comes complete with extra cool bits. 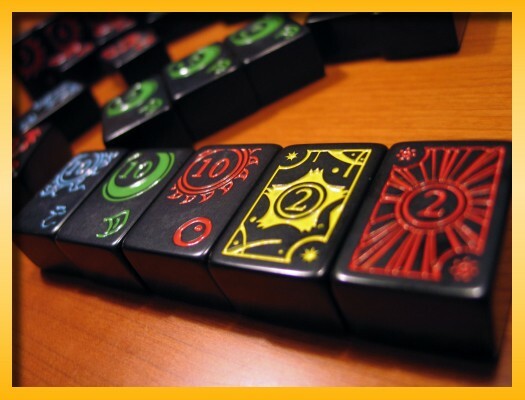 Players begin the game with a random set of tiles. 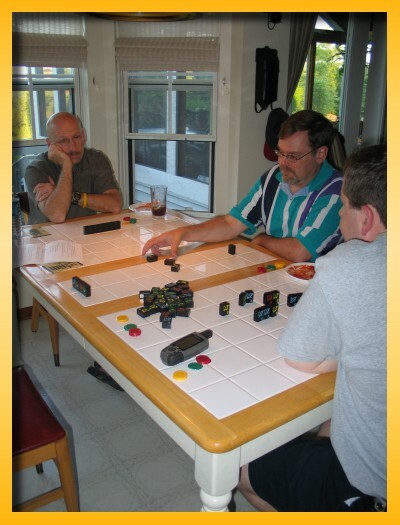 A round begins with the starting player (the holder of cloud 3) placing a meld of tile(s) onto the table. Play passes to the left and that player must play another meld of the same number of tiles (1, 2, 3, or 5) of higher in rank. If he cannot play, he must pass. Unlike Tichu, there are no bombs or special low or high cards and no Dog since you do not play with a partner. Play continues until all players pass and the player taking the ‘trick’ places the tiles to the side. The tiles used in the tricks are not used for scoring. Subsequent hands are begun by the player who won the last hand until someone runs out of tiles triggering the end of a round. At the end of a round each player, beginning with the player who ‘went out’, is paid chips by all other players equal to the difference in the number of tiles remaining in their hands. For each 2 in your hand, you must double the number of chips. Scoring continues with the next player and all other players paying chips to that player, etc. until all players have received their appropriate number of chips from all other players. The game ends when you complete an agreed upon number of rounds (usually 5) or until someone runs out of chips. I haven’t even played the game yet but I can’t get over how good it looks and feels. The ‘eye candy factor’ and the ‘clack factor’ is extremely nice to behold. My parents are staying with us this weekend to see Noah’s violin recital so maybe I can get them to play a game or two…or three.